Here's a look at the 2 weeks worth of meals prepared by Kina's grandma. Clearly eating was a significant moment of each day. Safe to say that I've gained some poundage during my stay here. EGG SALAD/SHISO SANDWICH (THEY GROW SHISO OUTSIDE THEIR HOUSE). PICKLED CUCUMBERS THAT'S BEEN FERMENTED IN A MIX THAT'S BEEN IN THE FAMILY FOR OVER A HUNDRED YEARS. THEY GET MILK DELIVERED TO THEIR DOOR EVERY OTHER DAY. 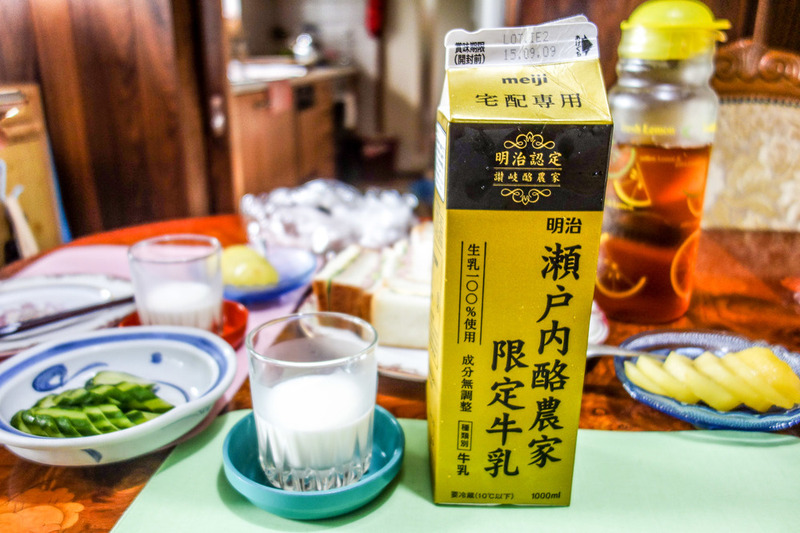 JAPANESE MILK IS CREAMIER AND SWEETER THAN AMERICAN MILK. BREAKFAST SANDWICH: HALF SAUSAGE, CHEESE, AND LETTUCE, THE OTHER HALF CRAB MEAT, CHEESE, AND LETTUCE, BOTH WITH TUNA MAYO. SWEET AND BUTTERY JAPANESE BREAD FROM THE BAKERY. TOASTED JAPANESE BREAD WITH HALF BUTTER, HALF JAM. MAME PAN (RED BEAN FILLED BREAD). KURO GOMA PAN (SESAME SEED BREAD). SWEET AND BUTTERY JAPANESE BREAD. LEFTOVER BREAD CRUSTS KINA'S GRANDMA PAN FRIED in OIL AND ADDED SUGAR AND BUTTER TO. SUN-DRIED TOMATO AND CHEESE SANDWICH. CURRY PAN (CURRY FILLED BREAD COATED IN BREAD CRUMBS). HOT DOG FILLED JAPANESE BREAD. SOMEN (JAPANESE WHITE WHEAT NOODLES, SERVED COLD). MENTAIKO ONIGIRI (FISH EGGS) AND UME ONIGIRI (JAPANESE PLUM). RAW EGG YOLK OVER RICE. RAW EGG YOLK OVER RICE, mixed. ROLL CAKE AND ICED COFFEE. RICE WITH SQUID AND MENTAIKO TOPPINGS. HAYASHI RICE (HASHED BEEF STEW). KINA'S GRANDMA SPENT A SOLID STRAIGHT HOUR MIXING THE FLOUR AND BUTTER BY HAND FOR THIS DISH. PLUM WINE THAT'S BEEN FERMENTING FOR 3 YEARS. THE PLUMS COME FROM THE TREE IN HER BACKYARD. SHE HAS OTHER CONTAINERS THAT HAVE BEEN FERMENTING FOR DIFFERENT AMOUNT OF YEARS. TEMPURA EGGPLANT AND SWEET POTATO. KARAAGE CHICKEN (JAPANESE FRIED CHICKEN). GYOZA AND POTATO SALAD WITH OKRA. KINA'S GRANDMA PREPARING KAWARA SOBA. ONE OF MY FAVORITE DIshes here: KAWARA SOBA (SOBA COOKED ON A ROOF TILE WHICH results in CRUNCHY noddles). DAIKON AND CHIKUZENNI (CHICKEN AND VEGETABLE/ROOTS DISH). KINA AND I COOKED DINNER ON OUR LAST NIGHT: CAPRESE, TERIYAKI CHICKEN DRUMSTICKS, AND SASHIMI (IN CASE KINA'S GRANDPA DIDN'T LIKE WHAT WE MADE). cakeohland. all rights reserved, 2018.